There are times of the year when I seem to be almost permanently teetering on the edge of a cold. So as well as reminding myself to dose up on Vitamin C I’m craving something spicy and comforting. This also coincides with a bit of a love affair I’m having at the moment with chicken. It’s just so goddamn versatile. Cooking in January is hard going. It has to be healthy and comforting, my gut is exhausted by Christmas and it’s dark in mid afternoon. None of this encourages creative cooking so the chicken, happy to be trussed, chopped, fried or roasted in different cuts is a saviour. This soup is a pure Monday night recipe. Have a little leftover roast chicken from Sunday lunch and save the bones for stock. Throw in some ginger to help with a snuffily snout and delicate digestive system. After much googling and video watching I also understand what “egg drop” is. 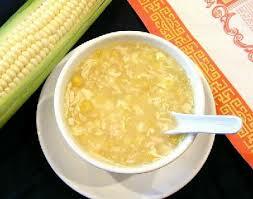 Most importantly, this soup actually tastes like real Chicken and Sweetcorn Soup. It should be served in a polystyrene bowl. I’ve made a few changes and altered amounts purely for taste. While I was making this soup I also made a second, replacing the chicken and sweetcorn with lamb and spinach. It was also delish so use the basic structure and try different flavours. This makes a comfortable amount for two. If your making your own stock add the bones to a large pan with an onion, carrot, bay leaf and cover with water. Make sure you’ve removed the leftover chicken but don’t worry if there’s a little left on the bones. Season to taste. Allow it to boil and them simmer for around two hours. Drain the stock. You can save it into ice cubes to keep for the future. This is a fairly thin stock as it is purely bones but if you’re saving the chicken for another recipe you don’t want to cook it twice into a soup and stock. It is, however, less salty than the packet variety and adds more of a flavoursome punch. Start with a deep pan. Heat a little oil and add the ginger and garlic. Allow both to cook gently but don’t let them brown. Add the chicken and stir until it’s coated with the oil, ginger and garlic. The chicken I used was already cooked as it was leftover. If yours isn’t then cook the chicken until it’s browned slightly. Add the flour and stir. Pour in the stock and stir until the flour is absorbed – this will make the stock a little thicker. If you don’t have flour you can use cornflour. Allow to simmer for five to ten minutes while you mix the egg with the lemon juice and beat together. Tip in the sweetcorn. Next is the egg drop. You know what this is, it sounds technical? Yeah you drop the egg. That’s it. It sounds so much more exciting, like you have to stand on a stool and do it from a height. Nope, just pour the egg in slowly and stir in. The heat doesn’t need to be too high and this is the reason why – add the egg to a hot pan and you’ll get scrambled egg soup. And that’s it. Pour into bowls, add a few drops of soy sauce and you’re good to go.